The Republic of Rumi: a Novel of Reality (2007) was a book in which I attempted a new approach to Iqbal Studies. Since then, I have realized that the idea can be developed further. The message of Iqbal is relevant today. It can be helpful in finding solutions which can be acceptable to the masses and not just the experts - quite possibly in many cultures of the world. Iqbal's message is a reinterpretation of the message of Rumi for our times. What will be gained? The benefits can be at the national level as well as international. 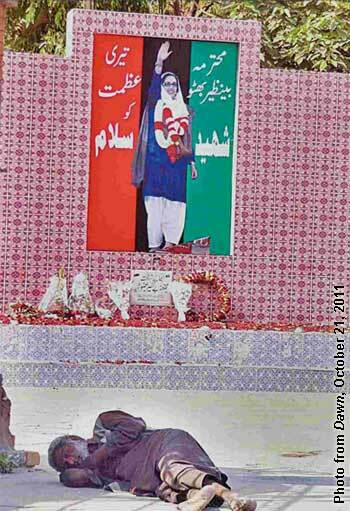 The object of my Persian poems is not to make out a case for Islam; my aim is simply to discover a universal social reconstruction, and in this endeavor, I find it philosophically impossible to ignore a social system which exists with the express object of doing away with all the distinctions of caste, rank and race; and which, while keeping a watchful eye on the affairs of this world, fosters a spirit of un-worldliness so absolutely essential to man in his relations with his neighbors. This is what Europe lacks and this is what she can still learn from us. (In my book, I tried to imagine this “universal social reconstruction” through an allegory, ‘A Parable Never Told’). A better understanding of the work of Iqbal is the way to begin. Marghdeen Learning Centre (MLC) has been added with the support of Iqbal Academy Pakistan. An online certificate course, ‘Introduction to Iqbal Studies’, is offered four times a year at MLC. The course is certified by Iqbal Academy Pakistan. It is promoted internationally by Dr. Iqbal Society of North America (DISNA) and in Pakistan by Topline Publishers. I am convinced that the complete scope of Iqbal Studies can be realized only if we readjust our understanding of five areas to the vision of Iqbal. These areas are history, literature, political science, religion and science (together) and education. Hence, the next step may be the development of a new syllabus in which various subjects are approached with the help of the guidance provided by Iqbal. It might be more desirable to start introducing this new syllabus through informal and non-formal education. Marghdeen Learning Centre has also started offering courses in some of these areas. Self-Development through Iqbal is a certified course which offers a new introduction to literature with special focus on Javid Nama but also includes sections on Nezami, Attar, Rumi, Shakespeare and Shah Abdul Latif Bhittai. Another course, History According to Iqbal, is likely to be offered in January 2012. By A. R. Cornelius, Chief Justice, Supreme Court of Pakistan. This paper was read as inaugural address at the Iqbal Day session organized by the Central Iqbal Committee, Lahore, on April 21, 1964. At the very outset I must make an apology. It is for my apparent inadequacy to fulfill the function which I have undertaken today. Iqbal is par excellence the poet of Pakistan and his published works are clearly such as require for their full understanding a thorough grounding in Muslim scriptures and traditions and acquaintance with the classical allusions of the literature of the Muslim countries. I do not possess such a grounding and I regret it. I would therefore seek your indulgence should you find that I speak superficially or that I am guilty of error in my discourse. I am aware of the great extent to which the poet's work has been read and absorbed by a majority of the literate people of Pakistan. But it was a high honour that was offered to me, and a great trust that was displayed, when I was asked to speak to this learned body at their annual celebration of Iqbal Day and I felt quite unable to decline the invitation. What I have to say I say in all sincerity and to the best of my ability, and I would like to add that I offer my thoughts, as I do my homage, to the poet, in the capacity of a humble citizen of Pakistan. What I shall say has nothing to do with my official position. Freedom of expression is a fundamental right and on a rare occasion such as the present even a person holding an official judicial position may invoke it, with of course the necessary limitations. To savour to the full the quality of a poet such as Iqbal, it is clearly necessary that one should have an appreciation and acceptance from the heart of the dogma and the ethic of Islam. How then can I, a Christian, attempt to speak of him? It would be of course wholly inappropriate for me merely to repeat what I have read concerning him. It would not be in keeping with the occasion, but there is a factor which has in my case brought about a partial capacity for understanding the meaning and purport of much that the poet thought and wrote. I refer to the fact of my having been bound by oath to serve and protect the interests of the State of Pakistan from its very foundation. It was founded as a Muslim State, and repeatedly, the constitutional objective has been solemnly expressed that principles of democracy, tolerance and social justice as enunciated by Islam were to be the guiding light of the new State. The words [of] a Constitution have an overpowering effect upon any person who is pledged to work it in letter and in spirit. I have even enjoyed the privilege of being required to interpret the Constitution from time to time. Such an experience cannot fail to rouse an ambition to be of use in fulfilling the requirements of the Constitution which one serves, and thus inevitably one becomes animated by the spirit which has been breathed into it. I am therefore not wholly without qualification to place before you my appreciation of the poet's message in certain aspects, such as are relevant in our present circumstances. If Iqbal's poetry had anything of the romantic, it was the romance of history. All the references to great events in the history of Islam were loaded with purpose. It was a purpose that was truly revolutionary. At the period when his mind had been filled with knowledge gained at home and abroad in the best academies, and his thought was mature, events had begun to arise which tended to disturb the minds of Muslim subjects of the British Crown, who had till then been living in happy subjection through a long period of peaceful foreign rule. That rule was paternalistic in its impact upon the subjects, but was nevertheless highly charged with politics, and was consequently extremely sensitive to all factors of importance and unimportance, in weighing the claims of rival communities. Iqbal found that his people were living under the weight of a two-tiered subordination. Lack of population strength and of importance in the fields of education, commerce and industry had led to this community of erstwhile rulers being depressed below the majority community under a top layer of foreign rule. Moreover, the prospect of self-rule on the lines of British democracy, namely, the rule of majorities, had been held out at a remarkably early date, although the transfer of power even at subordinate official level was timed at a snail’s pace. The scheme of education was designed to produce clerks rather than administrators among the people of the country. As in the army, so on the civil side, the purpose until very late in the day was to keep the officer class almost wholly free from infiltration by Indians. A settled and inbred feeling of subjection was thereby successfully fostered in the entire population. It could be maintained so long as general contentment by [sic. be] ensured by tried methods of personal rule through trained and competent administrators. The poet's purpose was revolutionary in this sense that this double subordination was to be overcome not by the Fabian methods of gradualness which the foreign rulers were offering, for that would be to perpetuate the depression of their state. His appeal was to a long-buried self-respect and pride, still smoldering under the ashes of a lost empire. His answer to the question what was to happen when the threatened rule by the majority overcame the country was a direct appeal to the spark of religious fervor, that he knew still burnt in the heart of each individual member of his community. In words of gentle persuasion and high inspiration, coloured by reference to the gigantic achievements of their forbears, in the fields of military conquest, of administration, in the arts, in the realms of pure thought, his voice reached ears which had long waited for such encouragement. The appeal was not only to the literary or the intellectual classes. He was aware of the power of poetry over the emotions of Muslim peoples at all levels, and he set about providing the music which would stir their blood and steel their courage against the struggle which was already upon them, though for the most part they were unaware of it. Practically all that he wrote carried this urgent appeal to superhuman efforts in order to avert the present danger of perpetual subordination, if not extinction. The glories of the past were recounted, some not much more than a century ago, and held out as proof that there were prizes which they could win. Prizes, rather, that were the birthright for a chosen people to whom the Almighty had been pleased in the past to grant the power of high achievement. It became incumbent upon him, who was raising such thoughts in vast numbers of his fellow Muslims, to provide the conditions under which the qualities which he was invoking could find scope for their display, and the way towards which he was guiding them could find extension. Subjection and servility were intolerable. Only from free people could there be expectation of full and free exercise of the powers that were to be let loose when his dream came to be realised. Reading his works one does not get the impression that he realized how soon that fulfillment was to come. 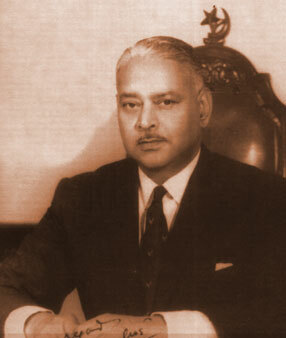 Had he been aware that as early as 1947, there would be partition of the territories of the old India, providing areas in which Muslims would move as free citizens in a Muslim State, I have no doubt that the poet would have included here and there among his writings, indications of the practical problems with which they would be faced when the dream of freedom reached the dawn of realization. Schooled as he was in true concepts of political philosophy, he would have realized that freedom and the extension of rights must necessarily be accompanied by an enormous intensification of responsibilities. He would be aware that his people had been living as communities under foreign rule for a century and a half, and that the intention was to hand them over to the political control of a handful of people, distinguished in their several ways, but as yet insufficiently trained in the art of political organization of a free people. A people, moreover, whom he had encouraged to think of themselves, each in his place as a Divinely grouped band of heroes. But he died before the consummation came. To each one of us, a counted number of moments has been allotted by the Divine power, in which to fulfill his life's work. Iqbal had lived his moments at an exalted height of literary and philosophical endeavour. The intensity of the thought shining out of his pages is proof enough that he wasted not a moment of his allotted time. But inevitably that time ran out. His wisdom was not available when it was most needed to guide his liberated people in the path of self-rule. I propose with your leave to present to you certain aspects of the problems of independent existence as a free State, upon which the sage would undoubtedly have spoken had he been among us. At a number of places in his writings you will find the poet complaining of the immobility of religious and political thought in Islam over the preceding 500 years. Yet, he was a firm believer in the eternal and universal quality of the basic principles of Islam such as would enable their adaptation to all changes in human conditions as they came to be. He urged his readers that the time had come, as he put it, to "re-evaluate our intellectual inheritance." Emphasizing the force of the integrating principle of Tauhid in Islam, the poet had much to say on the subject of Ijtehad, which I may perhaps translate as the capacity to take an initiative in the region of fundamental law. He was not a believer in the claim of finality set up by certain schools of law which had ceased to be active some centuries earlier, and we find him welcoming the liberal movement while, at the same time, indicating the danger of disintegration which attends too much liberalism. In one or two places, where the poet speaks of things that are to be, he declares himself in favour of the republican form of Government. He speaks of such a form of Government as being "not only thoroughly consistent with the spirit of Islam, but it has also become a necessity in view of the new forces that are set free in the world of Islam." Elsewhere he said: "The growth of the republican spirit and the gradual formation of legislative assemblies in the Muslim lands constitutes a great step in time." It would indeed be a very long step, for it seems that political theory among the thinkers of the Muslim world had not advanced since the days of Ibn Khaldun and Ibn Rushd. On the organisational side, the theory had always involved the concentration of power in a single hand, conceived as an absolute monarchy, operating through a body of persons like-minded with the monarch, known as the asabiyeh. Philosophical speculation was concerned with questions relating to the succession to the office of the chief executive, and eventually a stage was reached where, after a long insistence upon legitimacy according to the accepted mode, it was finally agreed that even a usurper must be tolerated provided that he does not violate the Shariah and works for the integrity and betterment of the community. A well-conceived theory was developed of the rise and fall of dynasties in four generations. The political ethic of the present day will certainly not accept a life of four generations for any Government that is established. The current view is that a Government is of the people by the people and for the people, and it must last so long as the people remain one. A people or a nation is constituted by geographical, historical, economic and last but not least, religious forces of integration, and having a right to admission to the comity of nations, and therefore, the protection of all other nations it expects to form a permanent institution. The forces of disintegration in a nation so constituted must lie far deeper in the general human character and in the nature of their organisation, than the mere dissolution of an asabiyeh or failure of governing capacity in a single family. Today, it is necessary to build the foundations at the level of common humanity, and to build them for all time. Iqbal in his inclination towards liberalism and his preference for republican Government indicates beyond doubt that his thought was not confined to the rise and fall of dynasties. But it does not seem to me that his thinking had reached the stage of devising practical steps for the inculcation and introduction of the democratic ethic among members of his community. The processes by which among the peoples of the West it had become a settled and unshakeable belief that Government was always to be of the people, by the people and for the people had somehow passed the Muslim peoples by. Royal heads had rolled in Europe under the sword of the common people in more countries than one. The divine right of kings had been thereby laid low and kings were thereafter only to be tolerated in proportion to their utility. In a great shedding of blood, the French nation was baptised into the doctrine of liberty, equality and fraternity. By a practical demonstration the people had taken power into their own hands, the processes by which in country after country that power was entrusted by them to a chosen leader to be exercised under the watchful eyes of the representatives of the people, for the security and well being of the people, had been set on foot. In the light of after knowledge, these world-shaking events proved to be steps in the march of humanity towards a goal, but undoubtedly at the time when they occurred, they appeared to all as a vast calamity. No such calamity appears to have fallen on any royal head among the Muslim nations. To be sure not all of them died natural deaths, but they never died at the hands of any who were not their equals, or otherwise than in a dynastic disturbance. Therefore, the poet must have been well aware of the need to provide his choice of the republican form of Government with a respectable heredity, a kind of ideological lineage, drawn from the fundamental principals of Islam. In India, a gradual process of drawing the people into their councils had been carried on by the foreign rulers for a great number of years, and the country had been schooled, in a secular manner, into a settled belief in the excellence of British-style democracy. When the poet selected the republican form of Government, I cannot conceive that he was thinking in terms of a democracy of the British type, since there are radical differences between those two forms. It seems unquestionable that his belief, if not his intention was, that the whole matter would have to be thought out de novo. And so situated would not his first thought have been to carry conviction to the individuals in whom he had lit the spark of heroic and faithful endeavour for the realization of the Divine Will? He must provide for them a rational basis for believing that the selected type of Government, in which power was to be derived from the people, was in its essence dictated by the principals of Islam. He held that to regard religion and the State in a Muslim country as two sides of the same coin was to place them too far apart, for they were in fact completely one. No doubt need be felt that had he survived to see the realization of the dream of vigorous independence which he had conceived for them through his poetry, it would be his duty also to ensure that they exercised the rights and duties of democratic citizens in the spirit of their own faith. For, if the machinery were imposed upon them from without as a kind of foreign system, then its franchises and facilities would be found only too apt for unscrupulous employment. All over the world today we see that when a balance of rights and duties of citizenship has been imposed upon a country from without, under foreign rule, even while that rule subsists, but much more so when it is withdrawn, the first casualty is that of scruple. Politics in the worst sense steps into the scene, and the unrestrained pursuit of personal advantage becomes the order of the day. But it is certain that Iqbal with his great belief in the integrative and corrective effect of Islam in relation to human institutions and the human character would have been at pains to provide, as I have said, a true religious and ideological foundation for the democracy which was to come. I suggest that that is a task which his followers and disciples may well consider to be of the first priority for themselves. Their leader and teacher had sought to create a positive character in his community, which in the way of religion was to be productive of great achievements when the day of freedom came. It is theirs to fill the need which clearly arises now that the democratic process has been accepted on all hands, to support and equip these processes with ideological derivation from the ancient and eternal principles. Already in Iqbal's time, Muslim countries had commenced to convert to democracy, and the process is not to be halted. What is necessary is to fill the gap of five centuries, and to provide the citizens, upon whom the burden falls of operating the Government through the democratic process, with a firm foundation of belief that in doings they are doing no more than following the highest dictates of their religion. The time is propitious for the commencement of such an effort. An earnest thinker may even feel that the state of our country demands that such an effort should be made. Under a leader of unbounded courage and devotion, the machinery of democracy, according to the ethic transmitted to us through administrative processes by our past foreign rulers, has been revised. The new processes are in actual operation, as a channel for expression of the people’s will in the political form. Would Iqbal have been content that the philosophical basis should be, as it is in the secular West, one of mere political obligation? Political obligation, in that sense, undoubtedly has a high and noble ancestry. It rests on principles of citizenship, derived from the practice of the Greek city-states, which received their first statements in the dim past at the hands of the most famous philosophers, of Socrates and Plato and Aristotle. The interplay of rights and duties as between the citizen and the State, and as between citizen and citizen has in the course of two and a half millenniums received considerations and clarification from the greatest minds of each succeeding age. In a country here and country there, you may find that politics is still practiced in that clear and purifying light. But it is no exaggeration to say that the ethic has been almost universally eroded. Putting it in the fewest words, politics is most generally practiced as the short road to material advancement for the practitioner. Opportunity lies at the feet of those in a democracy who succeed in gaining representative status … and they are human after all. There is regrettably little hope of survival of conscience where the sanctions of democracy are limited to western-style political obligation. A thinker of blinding perspicacity and utter honesty, such as Iqbal undoubtedly was, could not have remained unmoved by the conditions. He had worked to create a fervour of energy and vigour, in the apprehension of personal and communal obligation, which had nothing to do with merely material things. Every appeal by him to the individual was an appeal to brave endeavour, towards rising to the height of his personality in the light of God, for re-establishment of the institutions of Islam, among which the State occupies the highest place. Would he not then, having declared in favour of a republic, concern himself with the provision of a true foundation, for the relationship of State with citizen and citizen with citizen? There would be no alternative for him but to displace political obligation by the religio-political obligation, that is, to make every act in the democratic process, which he knew was inevitable, an act supported by religious conscience. He was pre-eminently qualified to perform this difficult task, difficult because it involved victory over man's baser passions and material desires, such as the pursuit of politics is universally known to arouse. It may interest some to learn that in the West, there has in recent years been raised, among thinkers, the question – is democracy a religion, or perhaps a quasi-religion? Quite naturally, it has not been raised by the politicians. It is among the most able protagonists of religion that this strange surmise has pricked the cells of understanding. Again quite naturally, their answer has been a very strong and positive "no.” It is said dogmatically that religion in each country has a "precisely defined form," it is “pluralistically structured,” etc. But are these answers really adequate? Is not a great part of the religious field of activity concerned with human conduct? Is it that religion has been free of historical processes by which the appeal to terror as the sanction for human conduct was replaced by the technique of threats and promises, and finally by the concept of the rule of law? The rewards and punishments of religion are no doubt carried over to the after-life, but does it in any way diminish the claim of democracy, enforced by the rule of law, that it provides for such rewards and punishments on earth as well? Does the honest pursuit of democracy involve no act of faith? Is democracy without its martyrs – can the death of Socrates ever be forgotten? The modern technique of formulation of fundamental rights – what is it but a new set of commandments to regulate behavior between citizen and citizen, as well as, of course, by the State towards the citizen? Superficially these rights are regarded as merely protective of the citizen against the power of the State. But it does not need any very careful reading or profound consideration of the words in which they are set out, to convince the right-minded citizen that each of these restraints applies to him as well. And, are the protagonists of the theory of total separation between religion and democracy aware that a great many matters which are formulated as fundamental rights in various Constitutions have been made the subject of careful examination and precise pronouncement in some of the highest of religious edicts? I refer only to the two famous Encyclicals, the first by Pope Leo XIII going by the name Rerum Novarum, and the second by the late Pope John XXIII entitled Pacem in Terris. The curious will find in these notable documents much in direct parallel with the fundamental rights with which they are familiar. But, it will be said that democracy may furnish compensation on earth – what has it to offer in the after life? That is indeed an interesting question, and one might ask: supposing that a people have been true to all the requirements of conscience, and have faithfully followed the law and the Constitution under which they live, what is to be their reward? The rewards of politics they all know, namely, leadership and pre-eminence among their fellowmen, but not all of them can rise to that shining height. Must the common fate then be to cherish virtue as its own reward? Must the noblest prospect remain that of being a well-behaved army under a leader of its own choice? Is the denial of the ego to be the aim and end of all the effort applied to its development? Perhaps one day, it will be found that such a prospect is lacking in inspiration for the ideal democratic citizen. It is only in the Communistic ethic that I find something of a promise to a people who have been faithful to their kind of democracy that their faith and effort will be rewarded, by something better than merely being contained in a communal unit, organized and operated by someone else. The Communists conceive of the State as a coercive instrument which firstly eliminates its opponents mostly by processes of re-training in the arts of labour and common living, and then acts to fill them with a consciousness of their civic obligation. All the agencies are supposed to operate in the final goal of equalitarianism among all the citizens, and this end, it is said, is to be achieved by the creation in the interim period of a ruling class with a mission to reform the whole people. It may sound strange that one class is created for suppression of all classes, but it is when the classes finally disappear that the reward is visualized. It is, that when perfection in the elimination of classes is reached, the State will itself disappear. It is said that the final disappearance of the State will come when the producers arrive at the controls of industry and true administration of affairs replaces personal rule. That prospect is so conditioned that is never likely to become proximate in any real sense, but nevertheless it is an attempt at formulation of a goal for righteous ambition, as conceived by the Communist, an end which does differ from the means. How would the sage have reacted to these ideas? If I attempt an answer, it is in all reverence. I suggest his answer would be that democracy in Islam can never be merely secular, but is essentially an exercise in the organization of the people in accordance with the fundamental beliefs of their faith. That by itself will furnish the necessary incentive to the people to be true to the dictates of the Constitution and the laws under which they live, in the hope of an eternal reward. Speaking for myself, I would wish that such might indeed be the case in all democracies. I was never privileged to know the poet, but to live in Lahore is by itself to live in communion with him and under the spell of his thought. His name will live forever. May his message spread and bear fruit among those to whom he handed over the torch to be carried for the good of their fellowmen! "A man can be loyal only to one country; a man can owe allegiance only to one State and anyone who tries to pose that he owes allegiance to more than one State is either deceiving himself or thinks that he can deceive others. And, therefore, Sir, to my mind, this is a very important condition that anyone who is to be a Member of this Constituent Assembly must owe allegiance to Pakistan and Pakistan alone." 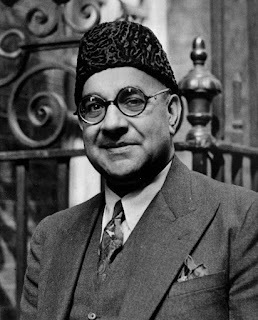 (Prime Minister Liaquat Ali Khan in the Constituent Assembly of Pakistan, Karachi, May 18, 1948). Once again there is a debate in Pakistan about whether a person can hold dual nationality and still be a member of the country's parliament. 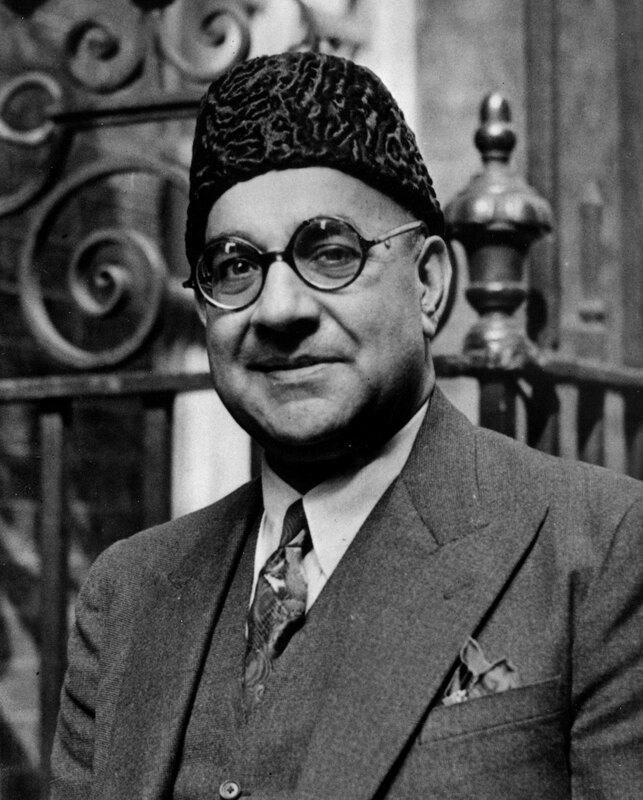 Incidentally, the issue was settled quite conclusively in the days of the first Prime Minister Liaquat Ali Khan (1947-1951). A bill was passed against this practice. The words quoted above were spoken by the founding Prime Minister on that occasion. Perhaps deliberately forgotten by many, they are somehow resonating now. Parliamentarian Raza Hayat Hiraj, while introducing a similar bill in the National Assembly, said in April this year, "Those who take oath of loyalty to another country cannot safeguard the interests of Pakistan." A recent article by journalist Khawar Ghumman's is also reminiscent of Liaquat's forgotten quote. The article 'Dual standards on dual nationality' in Dawn, October 21,begins with the question: "Would you trust somebody who has an exit plan to run your country?" Selection from Urdu poem 'Lala-i-Sehra' from Baal-i-Jibreel (1935; Gabriel's Wing) by Allama Iqbal. Note: The following text corresponds to the selection rendered in the video. Visit www.allamaiqbal.com for complete text of the poem. Growing up in Pakistan in the 1970s, I first heard the name of Gaddafi (called "Qazzafi" in Pakistan) with reference to his impassioned speech at the Islamic Summit Conference held in 1974 in Lahore. It was said that he stole the show with his blunt speech in favor of Pakistan's nuclear programme. He became a personal friend of our prime minister Zulfikar Ali Bhutto, who renamed the National Stadium Lahore as "Gaddafi Stadium". Wikipedia describes it as "the largest field cricket stadium in world with the capacity of 60,000 spectators". Ironically now, even if he gets buried in an unmarked grave as announced by the new regime in Libya, Gaddafi may still leave his name on the largest field cricket stadium of the world. 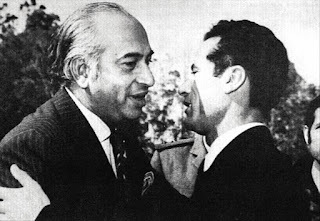 The warmth between "Colonel Qazzafi" and an average Pakistani was probably lost after the execution of Bhutto in 1979. 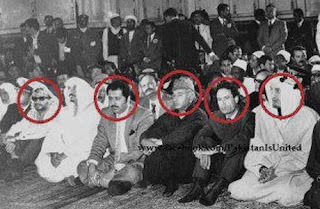 Information about the Libyan leader's involvement in international terrorism and his high-handedness at home, which had apparently been toned down by the media during the Bhutto regime, was now allowed to become more widespread in Pakistan. Things changed again in 1988 when the Bhutto family returned to power. Benazir's stints as Prime Minister were short (from 1988 to 1990, and from 1993 to 1996), but the kind of intelligentsia which came to rise with her stayed in place for a long time. Some of them were intellectuals who would denounce General Zia as oppressive dictator from one corner of their mouths and hail Colonel "Qazzafi" as liberator of the oppressed and a true friend of the people from the other. It was usually said that the younger lot in the Bhutto family, such as Benazir and her siblings, affectionately called him "Uncle Qazzafi". 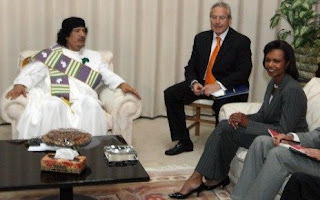 However, Gaddafi's stardom was over at least for the people of Pakistan. He faded out of the headlines once again in the 1990s; and made a comeback only in the 21st Century as the new ally of the West - the reformed warlord who was now eager to play his role in world peace, of course, with assistance from the US Secretary of State Condoleezza Rice. The rest, we may say, is not history but current affairs (no pun intended with any reference to the previous sentence). So, no need to go over it here, since this post has been written mainly for the benefit of the younger generation, many of whom may not have known this subjective side of the Pakistani part of the story. One lesson to be learnt from all the information which is coming our way with regards to the events in Africa and the Middle East is that at least we should give due credit to our history. Since 1947, we have had our share of military rulers and civilian dictators, and some of them may have aspired to stay in power for forty years, or to set up dynastic rule. However, hats off to the people of Pakistan, such a thing has never actually happened here. Let's remember this, so that it doesn't happen here even in the future.